There are so many summer trends out there right now that it can be hard to navigate, so I have done some of the heavy lifting and put together a list of trends to try. 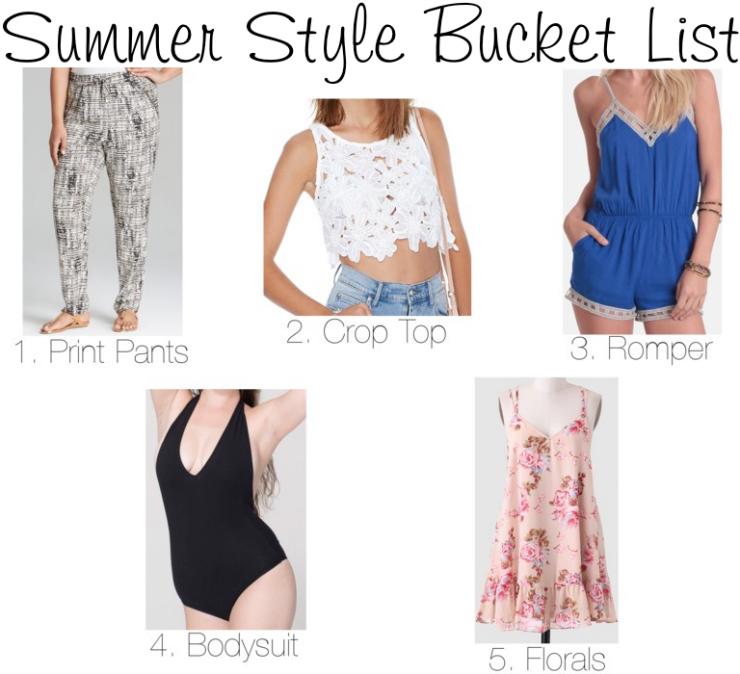 Here I have your Summer Style Bucket List, or the things that I think everyone should test out before the warmer months come to an end. Prom palazzo pants to more slouchy styles and all that comes in between print pants are everywhere this summer. I've only recently taken the plunge with this trend myself and absolutely love it! I encourage everyone to try it. This is one I have yet to try myself, but have been dying to. Crop tops are everywhere from the streets to the red carpet and there is no better time to rock one then summer. Rompers have been big for a few summers now and they are one of my favorites, but I feel like people are still hesitant to wear them. If you're someone who shies away from them, I suggest stepping out of your comfort zone and wearing one! You will not regret it! Bodysuits are huge right now and very convenient for a consistently tucked in look (minus the constant tucking in). I love the styles offered at American Apparel, but there are more blousy styles available at other stores if you don't want something so tight or low cut. I wrote about this trend back in May and it's still going strong. This is one of my favorite patterns that I think should be worn all summer long. These are just a few of the summer trends that are out there right now, but the ones that I think everyone should have at the top of their list! I definitely need to get myself a crop top because I feel like I am missing out by not having one. Are there any trends that you are loving that I don't have here? Any trends here you have or haven't tried? On a separate note, tomorrow I have to have surgery so I have some scheduled posts coming up for the rest of this week and the beginning of next, and then will hopefully be back to my regularly scheduled stuff. I will also probably be MIA on social media as well as I am going to be pretty out of it. In the meantime if you wouldn't mind sending prayers, good thoughts, positives vibes, or whatever you like my way it will be greatly appreciated! I hope everyone else has a good rest of their week and a fun weekend! 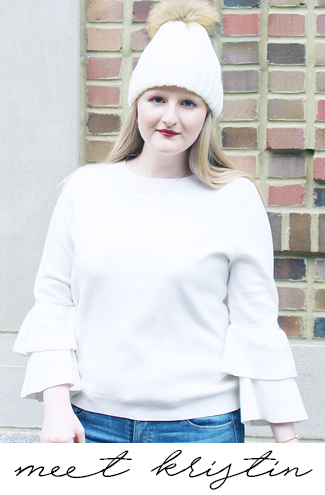 Today I'm linking up with Because Shanna Said So, and Ann Elliott and Pampers and Pearls. I am all about the crop top this summer!! Love all these trends. I really need to hop on the crop top train! Love all your summer staples! As you've seen I love a romper! Sending prayers your way for an easy surgery and a quick recovery. Yes!! Loving all of these trends!! Haven't gotten into the bodysuit yet but I definitely want to try it! !